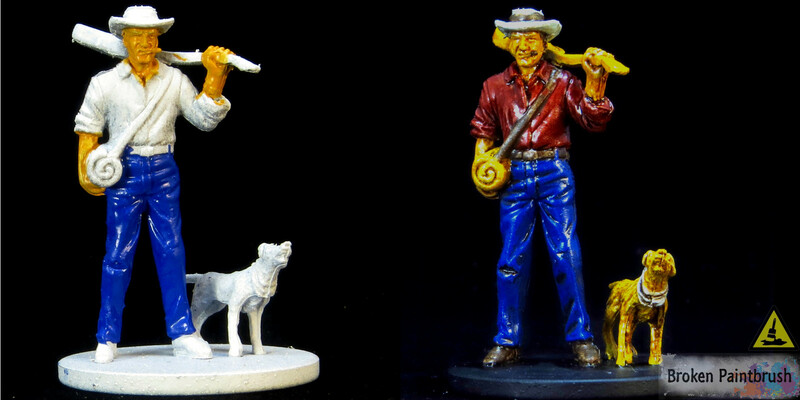 A second investigator joins the team of painted models, this week with Ashcan Pete. 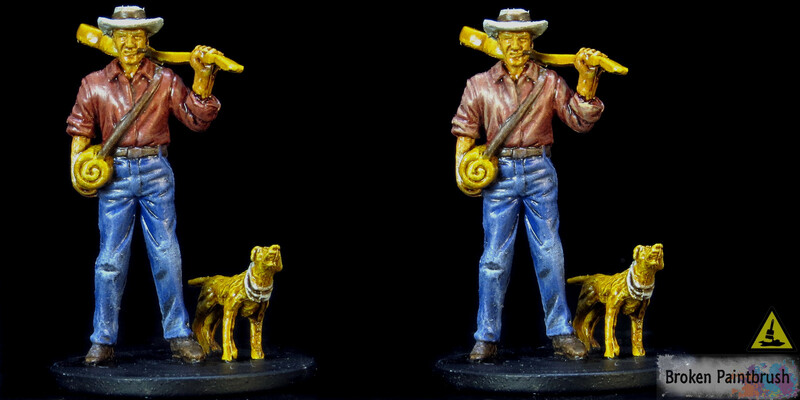 As with the other models of the Mansions of Madness game that I am painting, I have put together a painting guide for him and his faithful dog. As Ashcan Pete is traveler and vagabond, I painted his clothes to look more worn and threadbare with dry brushing gray over the base colors. It also seemed fitting to give him a rough beard. For prep, the mold lines were shaved down – well at least most of them. 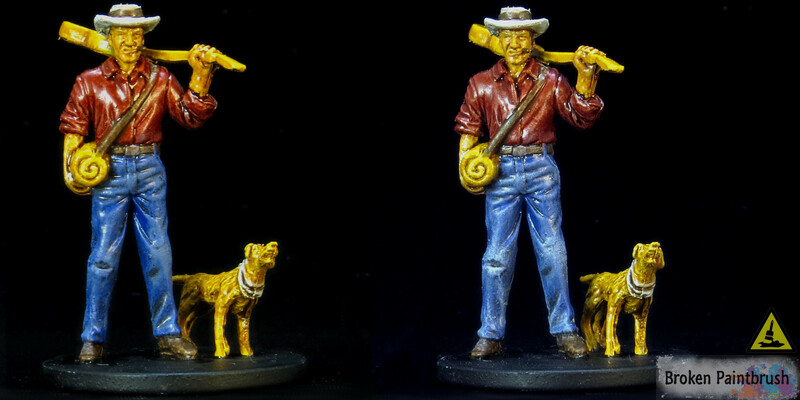 There are still a number of noticeable ones on both Pete and his dog, but for a board game piece I was content with the ones I did manage to remove. A white spray primer was used to provide the base coat for all the paints. The primer allows the acrylic paints to adhere to something much better than on the initial plastic. I don’t use anything fancy, just white spray primer I pick up at Home Depot. So I broke down the section below by area (jeans, shirt, skin, etc) for easier reference but I didn’t paint them in the same order. Instead, I laid down the base color for all the sections to block out the main colors. This makes is easier for me to get a sense of what each area will be and change the colors of accessories (like the hat or dog) depending on how the rest of the model looks. 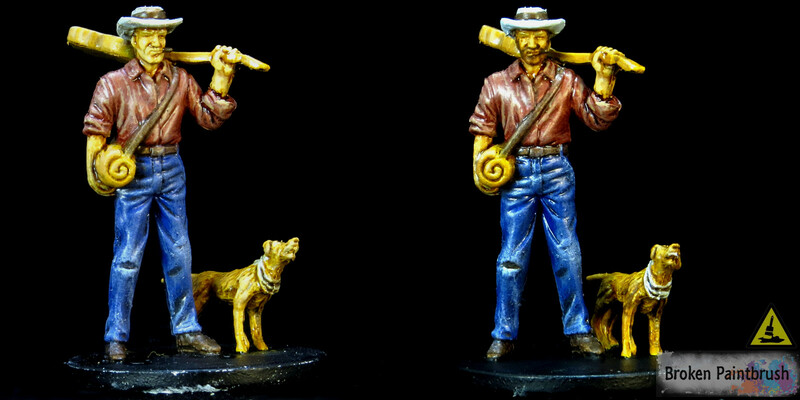 For Pete and many other of my models, I then apply a whole-model wash with Oiled Earth or Dark Brown. The provides the initial shading as well as creates a separation between the color areas – pre-black lining if you will. Here you can see what I mean by skipping around. The pants were base coated with Ultramarine Blue to provide a nice dark blue. The rest of the colors were blocked in before Dark Brown Wash was applied over the whole model. It does look a little shiny as the wash seems to have a bit of gloss to it for some reason. This is where it starts to get a bit messy but magically goes from blue pants to denim jeans. The drybrush picks up the raised edges of the model, but also leaves a dusty look which fits perfect for the clothing effect. The first layer was Sombre Grey, a fairly light blue-grey. While the dry brushing hits the raised areas, I also added a bit extra around the knees, back of the boot, and pockets – areas that would receive recieve a bit more wear. Wolf Grey was then layered with another layer of dry brush. It is a very light blue-grey and helps to make the pants look extra worn and dusty. For the shirt, I wanted to go with a warmer color, a worn out flannel – but without painting the flannel pattern. This was base coated with Terracota as it is a nice brownish red. This was followed up with the Dark Brown Wash over everthing. To create the worn look, Tan was dry brushed over the shirt. This is similar to the jeans above in that the dusting adds its own texture to the area and the grey-brown colors add the worn look. Khaki was used as the final dry brush. It is almost bone colored, while maintaining the warmer red/brown side. After dry brushing, I did go back in with a detail brush to accentuate the ridges and edges a bit more where they large brush couldn’t reach. The brown leather on his belt, over shoulder strap, and boots was kept simpler as they have much less impact on the model. They were base coated with Burnt Umber, a very dark brown. The Brown Wash doesn’t do a whole lot for these areas other than adding some separation between it and the surrounding clothing. Finally, Khaki was dry brushed over it. Just like the shirt, the khaki adds a grey-brown layer that makes it look worn out as well as highlighting the edge. The dog, guitar, and bed roll were all painted with a yellow-brown to compliment the blue and red clothing. They were base coated with Plague Brown before the Brown Wash was applied. A dry brush Filthy Brown followed by Khaki were applied. By using Khaki yet again we are pulling together the different colors and unifying them. I later went back in and ‘black lined’ the recesses. This is a technique that uses a black or very dark brown wash and a detail brush. The wash is added only in the recesses and almost drawn between each color. Think of comic strips that have black ink between each color block – it defines the area more distinctly. The hat was a fairly simply Wolf Grey base, the Brown Wash, with a highlight of Ghost Grey. I kept it white as it helps draw more attention to his head (only white spot on him). The dog’s handkerchief was painted in the same colors. As a wanderer, I wanted Ashcan Pete to have a bit of a tan so the colors are kept on the darker colors for Caucasian skin. It was base coated with Medium Fleshtone followed up,with you guessed it, the Dark Brown Wash. Dark Flesh (which is actually lighter than Medium Fleshtone for some odd reason) was layered on. The skin was the one area on this model that was fully layered, meaning lighter layers of paint were added to the upper regions. Not only does this provide a smoother look (fitting for skin) but also contrasts with the rougher texture of the clothing. Sunny Skintone was then added as the top most highlight. It is a yellowish light skin tone and provides a nice highlight, while still keeping him some what tanned. To create the the rough beard, Medium Brown was mixed with Glaze Medium at about 1:1. This was lightly painted on his lower face, mouth, and upper neck. The idea is to darken the skin while allowing the skin tone and highlights to still show through. A second layer was added in areas to darken it a bit more. 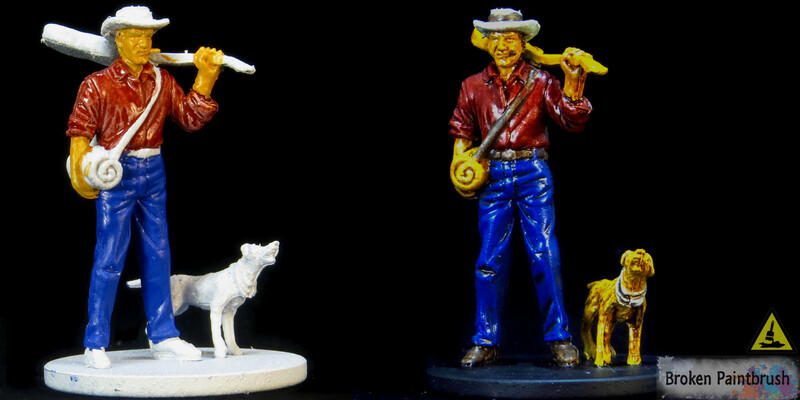 Final touches such as painting his eyes and cigar were added in and some more black lining to add additional color separation and Ashcan Pete was finished. I added a few coats of matte varnish to protect the paint as he was used. 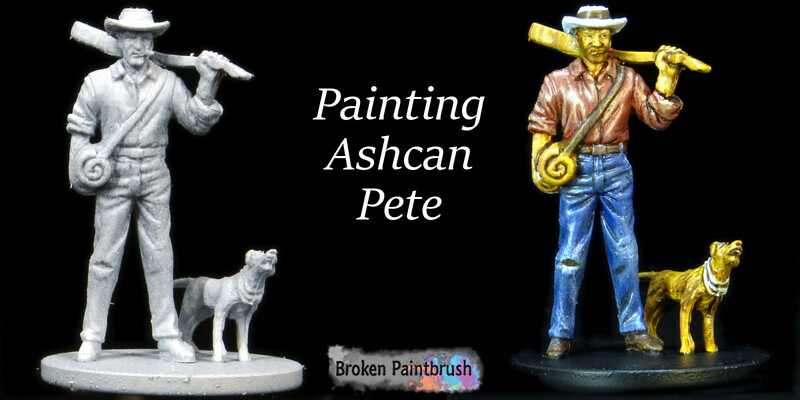 I hope you enjoyed the painting guide to Ashcan Pete and maybe learned a few new tricks. If you did, could you hit up the comments below and let me know your thoughts? I know Mansions of Madness isn’t everyone’s cup of tea so don’t worry, there will be more Orks and Knights coming very soon!